Did you know that Saint Paul used to be a haven for gangsters? 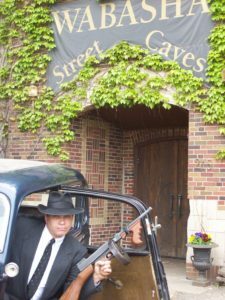 Learn more about St Paul’s dark and storied history by a tour of the Wabasha Street Caves and the Saint Paul Gangster tour as seen on the History Channel. Your Guide:……a nefarious gangster hood or his moll. The tour begins in the Wabasha Street caves, come hear and see the history of these sandstone caves. You will explore the original mined caves and see the finished caves (once a romantic night club called The Castle Royal). Hear the legends of the mobster massacres and ghostly lore in the most unique setting from Chicago to San Francisco. Then hop on the bus for our famous crook’s tour! Explore with us the sites of nightclubs, kidnappings, and gun battles associated with the 1930’s gangsters like John Dillinger, Ma Barker and Babyface Nelson. See the sights where the gangsters lived it up as they planned and executed some of the most notorious crimes ever perpetrated in the upper Midwest. Your guide takes you past the most infamous gangster hideouts and the famous nightclubs where many gangsters spent time socializing with the public.